When water reaches the edge of building, drainage prevents structural damage by redirecting the water and reducing hydrostatic pressure. Even buildings that have spray-on membranes are at risk from the pressure of below-grade water and the degrading impact of rocks and silt. 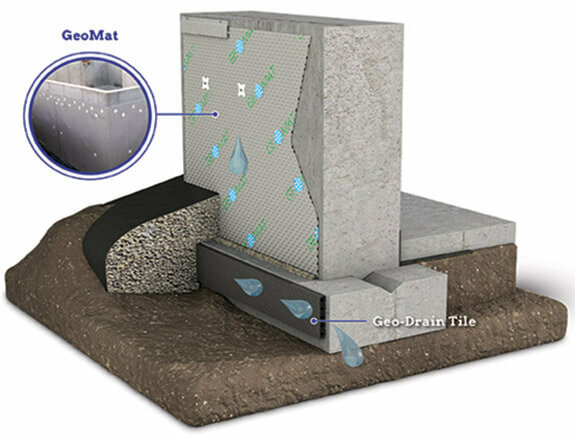 Like a drainage board, GeoMat Drain Roll removes water and resists hydrostatic pressure by channeling below-grade water towards footer drainage systems. These water channels are created by molding high density polyethylene (HDPE) into sheets featuring vertically and horizontally aligned dimples. The stud-shaped dimples create space between the sheet and the wall, allowing water to flow quickly and harmlessly away. In addition to channeling away below-grade water, GeoMat Drain acts as a barrier to protect liquid membranes against back fill soil and sediment. 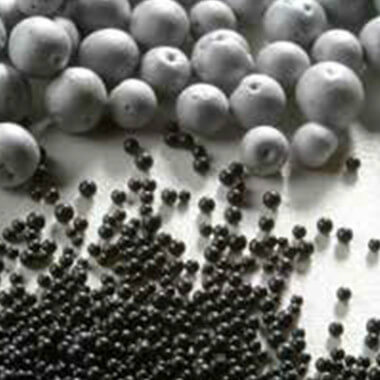 GeoMat’s strength and effective water-channeling design make it useful in a variety of applications. GeoMat Drain can compliment and protect a spray-on waterproofing or dampproofing membrane. 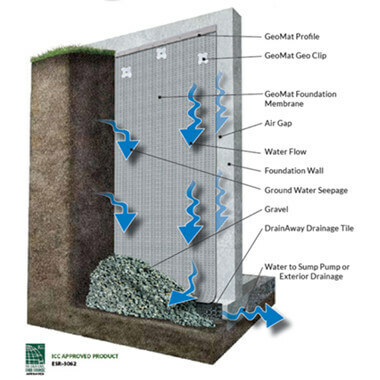 In instances where a drainage system is installed to reduce hydrostatic pressure, GeoMat may be used as a foundation dampproofing product as well as a waterproofing membrane. GeoMat accessories are available to facilitate any job and make installation easy. Mar-flex created GeoMat Drain Roll as a next generation green product designed to meet the rising demand for commercial and residential building materials with a low environmental impact. GeoMat is made of 100% recycled material, and can be used towards LEED building credits.